Vehicle: 1987 Nissan H.B. extended cab 2.4l 2 wheel drive. I have the 87 2.4l. does this apply to that engine. My truck failed CA SMOG test on the functional test because of too high of an idle so the timing couldn't be tested. After installing this thermo element I still need to adjust the idle screw but I have no tachometer. 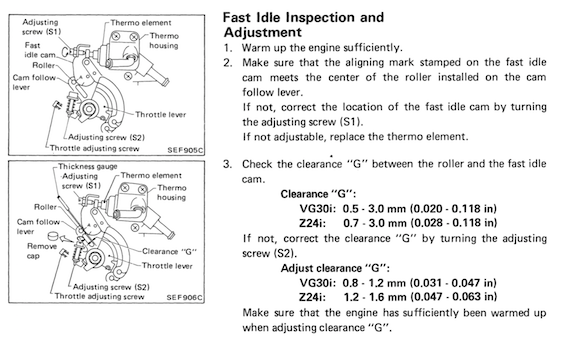 On page EF & EC 215 it tells what the idle speed RPM should be at but I could use some help. I'm trying to track down a place I can buy a multimeter locally that I can hook into the ignition system to test the RPMs. Which wires would I hook the tool up to on the pickup? Any of the spark plug wires? Last edited by Nate. ; 06-09-2018 at 07:52 PM. That should just be "normal idle speed". Basically, when you switch on the A/C, the idle speed should increase to compensate for the extra load. I'm not to worried about the A/C stuff, I don't even have one. The issue is I tried to get it smogged and my idle was around 1600 rpm. They needed it closer to 800 for them to do their timing check. I have no tach to tell me what the resting RPM is being adjusted down to. I guess I'll have to do it based on sound.